Bad blood runs in torrents through The Sisters Brothers, both in the violent altercations that are part of daily life in the expanding American West, and in the themes of revenge, responsibility and redemption being explored with astute sensitivity by director Jacques Audiard. As a pair of guns for hire in 1850s Oregon, brothers Charlie and Eli Sisters (Joaquin Phoenix and John C Reilly respectively, both excellent) stake their very lives on the might of their reputation and the accuracy of their gunmanship. While they are two very different people – Charlie thrives on the cutthroat nature of their business, while Eli longs for a more peaceful life – they are forever tied together through bonds of family and shared experience. When the brothers are tasked with tracking down Herman Kermit Warm (Riz Ahmed), an unassuming chemist who has invented a foolproof method for panning for gold, their plans are thwarted when their supposed ally, John Morris (Jake Gyllenhaal), teams up with Warm and goes on the run. When the foursome finally cross paths, however, the result is not the expected confrontation but, surprisingly, kinship and collaboration. The Western might seem like an strange genre fit for French director Jacques Audiard, after his more low-key works like A Prophet, Rust and Bone, and Dheepan. Yet his first English-language work – an adaptation of the beloved novel by Patrick DeWitt, which Audiard has co-written with regular collaborator Thomas Bidegain – provides him with a perfect landscape. This spit and sawdust world is the perfect prism through which to explore the ways in which place and tradition shape character and, particularly, masculinity; ideas that have also been central to his earlier works. 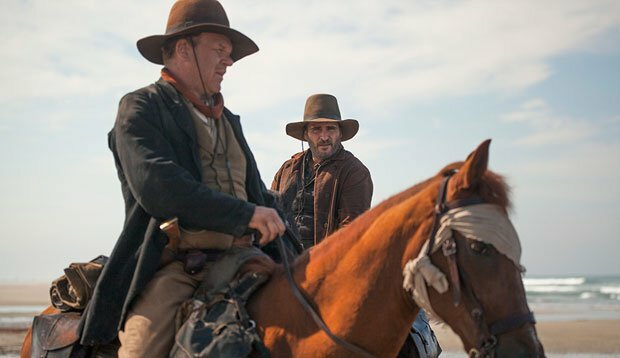 Indeed, while there may be many incidents of aggressive altercation in The Sisters Brothers – the film is bookended by two pivotal nighttime gun fights, and the body count is extensive – it is far more concerned with the moments in between, quieter periods of reflection and introspection. Charlie and Eli are revealed to be two sides of the same coin; while Charlie is a vocal advocate of the bloody status quo, Eli is a firm believer in finding another way. That his life, and prospects, are forever constrained by his unflinching loyalty to his volatile brother is one of the film's most moving elements. Through the pair's relationship and interactions (some violent, some touching), The Sisters Brothers also expertly navigates the intersection between past mistakes and future promises. That's not just evidenced in the way that the individual behaviours of these frontiersmen are forged by the sins of their own fathers but in the fact that, as they collectively stride ahead into a land of unlimited possibility, they are shaping it according to old rules of personal greed, ambitious consumerism and survival of the fittest. Despite the new communities springing from the dust, America remains defiantly a place where scores are settled in blood and men still eat, drink and sleep with one hand on their pistol. Underscoring these themes, and shooting in breathtaking CinemaScope, cinematographer Benoit Debie (Climax, Spring Breakers) hews close to the traditions of the genre – there are plenty of expansive plains, big skies and gunpowder flashes against the night – while taking great care to capture the often agonising intimacy of the story. We see troubled faces in close-up and the ooze of wounded flesh, while Eli's nightmares about his abusive father – whose legacy also looms large in Charlie's alcoholism – portrayed in off-kilter, shadowy blues. Similarly, Alexandre Desplat's energetic, wistful score reverberates, like the film itself, with both hopeful optimism and resigned melancholy. Screening on Fri 19, Sat 20 and Sun 21 Oct as part of the BFI London Film Festival. General release from Fri 5 April, 2019.